The Toyark has received two new official Star Wars images. 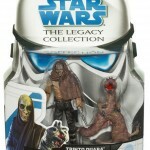 The images show the Star Wars Legacy Trinto Duaba & Dice Ibegon. You can check out the images by clicking the headline of the story.